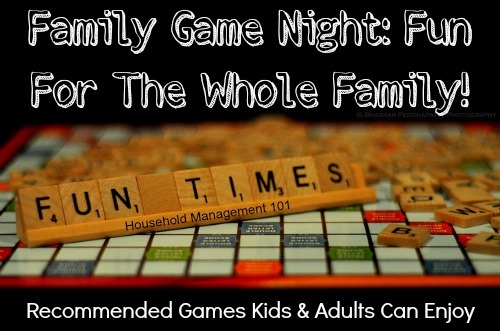 Family Game Night - Recommended Family Games For Kids Of All Ages! 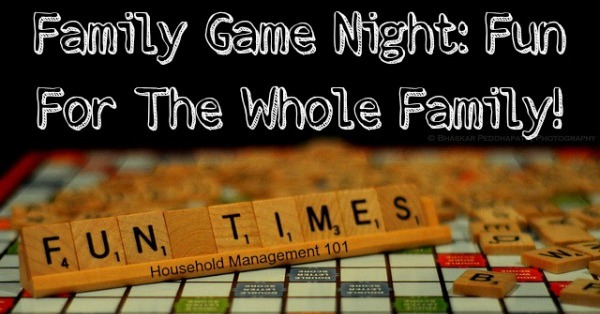 Family Game Night: Recommended Family Games For Kids Of All Ages! Family game night is a tradition we have in our family, every Friday night. As the kids get older it gets even more fun, as they are able to play more and more games. 1. You spend time together, talking, without the TV on. 2. It helps your children learn fundamental lessons of life, like taking turns and being a good winner and not a sore loser, along with fundamental educational skills like counting. 3. 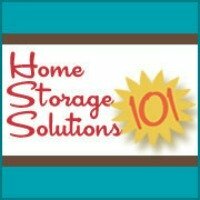 Building traditions in your home for your family will give your kids something fun to look forward to all week, but also great memories for years to come. Our family plays our kids' board games and other kids games after dinner and clean up on Friday nights. Sometimes we have a snack and drinks to eat while we play, sometimes not. We generally play on the floor, since it is easier for younger kids to play on a "team" when you are on the floor with them. Older kids play for themselves, sometimes with a bit of help from Mom and Dad until they get the rules of the game, and strategy, in their minds. Younger kids play as part of a team, as mentioned above, with either Mom or Dad, or with a older sibling. Make sure the younger child gets to actually participate, even if it is just moving the game piece, so they are involved. Try to choose games that everyone will enjoy. If the game is boring for everyone but the youngest or oldest of the players, no one will enjoy it as much as they could otherwise. Candyland - one of the classic board games from our own childhood, it is still fun for the kids now. It can get a bit boring for adults after a while, but kids don't tire of getting to Kandy Kastle, and no reading is required. They just need to look at the cards with colors on them to know where to move next. You can make it more fun by making sure no picture cards that send someone back to the beginning get down in the bottom of the pile. Click here for even more information about Candyland board game. 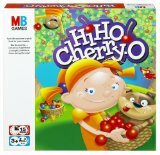 Hi Ho Cherry-O - this is a great game for introducing kids to counting. Little kids love it, and the rules are simple for everyone to learn quickly. Just make sure you're careful not to lose those little cherries, they are very small (and also a choking hazard for smaller kids). Click here for a cute video about Hi Ho Cherry-O. Memory - this is one recommended for 3 and up. If you play it with 3-year-olds do yourself and them a favor and don't lay out all the cards at once. Instead, lay out just 20 or so because they cannot remember, at first, where all the cards are if all of them are laid out at once. This makes family game night fun, not stressful. 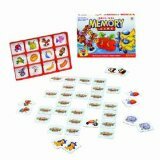 Also, I know they have lots of different types of Memory games now, with Spiderman, and Dora, etc., but I prefer the original Memory. The reason is that each of the pictures is of something completely different. If you choose Dora Memory, for example, 3 years olds don't easily distinguish between Dora in a green shirt versus a red shirt, and they get frustrated. 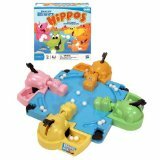 Hungry Hungry Hippos - this game is purely fun -- there is really no skill or strategy involved. The game can get loud (as can the kids playing it), so it is not ideal if there are smaller children asleep while family game night is going on, and you have to be careful of the small marbles, as they are choking hazards for smaller kids. But it can be a lot of fun as well. Uno - This is a classic card game that almost anyone in the family loves to play. You can have lots of fun catching people when they don't say "Uno" too, which is one of the best parts of family game night for our family. I know I have this listed as 4 and up and the actual Uno game recommends 7 and up, but my four year old can play it just fine with us, now that he recognizes his numbers. You can also play this as a "team" if the younger kids don't feel comfortable playing alone yet. Click here for some video tips about the Uno game. Click here for a video explaining how to play the Blokus game. 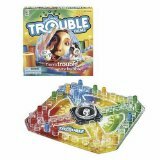 Trouble - this is a fun little game for kids and adults that has simple rules and strategy. I think of it, and Sorry as basically the same game, in different forms (with Sorry being slightly more complicated). We have both in our house, but you can easily get by with one or the other. You can learn more about the Sorry game here, and also the game of Sorry Sliders here. Mexican Train Dominoes - My whole family loves this game -- in fact the adults in my family stay up every night of holiday gatherings playing until late into the night, even after the kids have gone to bed. 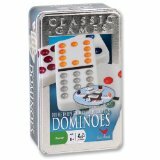 Getting a quality domino set, with a nice holder for them, is a great investment because you can play lots of games with dominoes but Mexican Train Dominoes is really getting popular now. The object of that game is to get rid of all your dominoes by forming a line, or "train," from your own personal line or playing off someone else's when you can. It is not complicated, but its lots of fun and you can talk, joke and laugh while playing which is what our family enjoys the most. After reading this list do you feel a game is missing? I'm always interested in more games to try, and potentially recommend. Please share your suggestions of more games for family game night, if your favorite has been left off, below. You can also skip down and read the games already recommended by others. What Family Games Do You Recommend? I've told you my family's favorites. 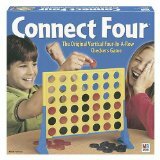 What about your family's favorite games for family game night? What do you recommend, and why?